We're all about dogs and dog lovers! We are an old fashioned gathering place for both you and your best friend and a perfect spot for self serve and full serve baths as well as professional grooming services. Is Spot in need of a new hair do’? Then stop on by or call to schedule an appointment! Your dog will be leaving with a new do’ that will be sure to impress any dog lover! Every dog regardless of breed or size needs a little pampering at the spa, and what a great way to do that by letting our award winning pet stylists help you with that. 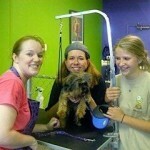 Understanding that every dog is unique and special, we work around your dog insuring he leaves happy and looking great! Grooming is a very important part of every dogs life, and can help prevent problems such as mats, too much shedding as well as help you find and identify any problems that may have gone unnoticed beneath all that fur. 4801 W. Park Blvd. Ste 421, Plano, TX 75093 (on Park & Preston in the Trader Joe’s Shopping Center) ... Tap on the map once to enable zooming.